Take control of your creative work. You’ve got big creative plans, a project you want to sink your teeth into, but somehow you never get it done. Answer these 10 quick questions to uncover the real reasons. Decide how you will take control and change course definitively. 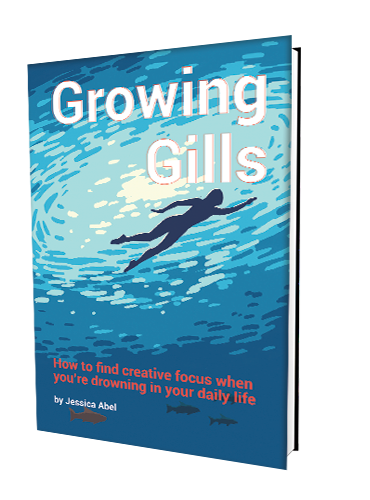 Dive deep and swim: Go from overwhelmed, anxious, and stuck, to consistent, clear, and in control of your creative life. Trish “Trash” Nupindju is a talented young hoverderby player on Mars. She wants desperately to go pro but her family is going broke faster than her escape velocity. Carla heads to Mexico City with a backpack, a few hundred dollars, and a head full of preconceptions. A story about finding yourself by getting lost. Comics short stories of young Chicagoans grappling with serious questions, such as Does she love me?, Can I stay friends with someone who has betrayed my trust?, and Can I make a life as an artist? The best of Artbabe Volume 1, including most of the stories from the first four (minicomics) issues, long out of print, and Vol 1 #5, the issue for which I won a Xeric grant. Trish Trash: Rollergirl of Mars - Released today! How do you know if it's time to quit? How to escape panic mode and embrace your life-expanding projects.